Kings XI Punjab snatched a sensational win as Delhi Capitals batsmen collapsed very badly at the death overs. At 144 for three after 16.3 overs, needing just 23 runs from 21 balls, it looked like a cakewalk for Delhi but they lost five quick wickets and as Sam Curran came to bowl the last over of the match, Delhi still needed 15 runs to win. 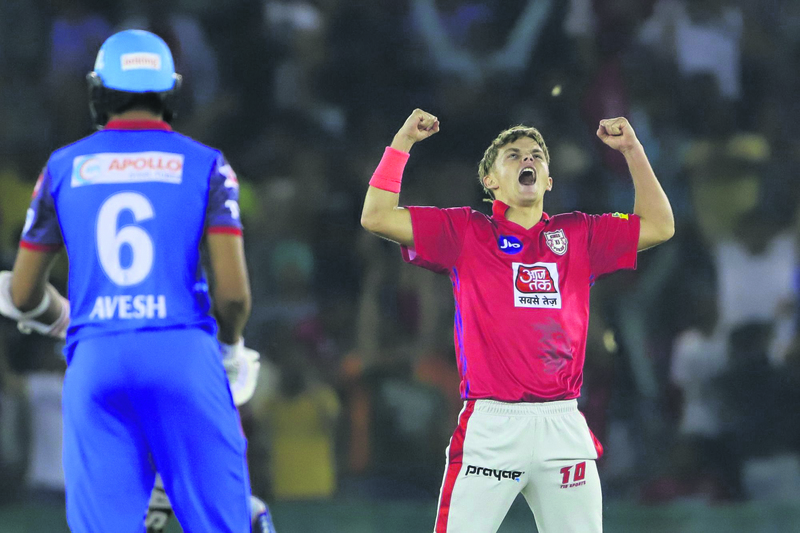 Curran completed a hat-trick as he removed Kagiso Rabada off the first ball of the over and then castled Sandeep Lamichhane off the very next ball to script a 14-run victory for his team. Earlier, the Delhi Capitals cashed in on the absence of Chris Gayle to restrict Kings XI Punjab to 166/9 at Mohali. Fresh from a match-winning knock over Mumbai Indians, Rahul shouldered the responsibility in the absence of his regular opening partner Gayle, by tucking a length delivery past midwicket to open KXIP’s scoreboard before pulling Morris for a six in the second over. But his stay was cut short the very next ball by a swinging delivery, which the third umpire confirmed upon review. Led by a special rearguard innings from skipper MS Dhoni (75 not out), Chennai Super Kings notched up a commanding total of 175 for 5 in 20 overs to recover from a precarious position of 27 for 3 against Rajasthan Royals in Chennai. While Dhoni was at his vintage best with the bat for the men in yellow, Dwayne Bravo and Suresh Raina also made worthy contributions to propel the hosts after a shaky start. On a pitch which was once again slow in nature but had a bit more bounce than the surface used last weekend, Rajasthan chose to attack in the opening six overs with their pacers. The move worked as they had CSK three wickets down at the end of the Powerplay, having sent back Ambati Rayudu, Shane Watson and Kedar Jadhav cheaply. Finally Dhoni's innings proved crucial and Chennai won the game. Having been ‘Mankaded’ in the first game, Rajasthan Royals found themselves fighting history in their game against Sunrisers Hyderabad. On Friday night, the Royals needed to come up with something special to get their campaign on track. Sanju Samson produced a magical innings as he tore the Sunrisers bowling to shreds on way to a belligerent century (102). With skipper Ajinkya Rahane (70) playing a well-calculated innings, Royals ended up with 198 for two. The Royals thought it was enough but the hosts had other ideas as they carved out a five–wicket win to keep their citadel intact. KL Rahul finally regained form to score a steady half-century which helped Kings XI Punjab to open their home campaign with an eight-wicket win over Mumbai Indians at Mohali. The win was also special for the home side as they finally managed to break the jinx of four consecutive losses to Mumbai Indians in Mohali. The Kings last managed a home win over MI in 2011. Punjab’s chase of 177 started on a steady note before Chris Gayle took charge of the proceedings with a destructive 24-ball 40. His partner Rahul (71 not out) played the perfect second fiddle as the opening duo put on 53 runs to lay the platform. Chasing 186 for an outright win, Delhi Capitals reached 185/6 in 20 overs sending their match against Kolkata Knight Riders into a Super Over in New Delhi. Prithvi Shaw slammed 99 for Delhi Capitals. Earlier, Andre Russell endured a beamer blow but still produced a blistering knock to lift Kolkata Knight Riders to a fighting 185 for 8. Both the ended their inning at 185. Finally in the super over Delhi won the match. AB de Villiers played a superbly controlled innings of 70 but failed to take Royal Challengers Bangalore home as Mumbai Indians registered a tense five-run win. Chasing a demanding total of 188 at the M Chinnaswamy stadium in Bengaluru, RCB could score 181 for five. This was the second consecutive defeat for the RCB. Earlier, the RCB bowlers and MI batsmen oscillated between being good and ordinary. A case to point was the 14th over of Mumbai’s innings in which leggie Yuzvendra Chahal (4/38) conceded 20 runs as Yuvraj Singh carted him for three consecutive maximums before being dismissed off the fourth delivery. If Kings XI Punjab skipper R Ashwin did not regret controversially running out Rajasthan Royal’s Jos Butler in their last match in Jaipur on Monday, he must be doing so after making a field placement error against Kolkata Knight Riders at the Eden Gardens. Local boy Mohammad Shami shattered KKR dangerman Andre Russell’s wickets with a superb yorker in the 17th over of the innings after the hosts were asked to bat first by Ashwin. Russell started walking back after being dismissed for three off five balls. But to everybody’s surprise, the field umpire called the West Indian allrounder back and signalled a ‘noball’ as KXIP had three, instead of four fielders, inside the inner circle then.